In celebration of @MagnumPhotos' 67th Annual General Meeting this June, they are offering signed, museum quality, 6x6 prints for $100. A 67 hour purchase window will open at noon EST on June 17th, 2014. Here's how it will work: In the days leading up to the sale, we will be posting ALL available prints with the hashtag #MAGNUMSquare on the@MagnumPhotos Instagram feed. Then, at noon EST on June 17th, the 67 hour purchase window will open and you'll be able to buy your #MAGNUMSquare by searching for your favorite print in the Magnum Photos online store. 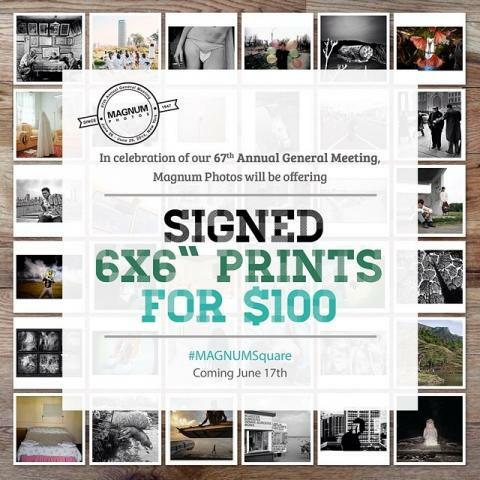 Once the 67 hours are up, orders will close and photographers will convene for this year's meetings and voting in New York City, taking a quick break to sign your #MAGNUMSquare, of course!